Stressed out over finding the perfect summer retreat for the entire family, including the beloved four-legged members? Well, ResortsandLodges' 'Top Summer Pet-Friendly Resorts' showcases a wide range of resort settings such the California Desert, the scenic Pacific Northwest, and even the four-season destination of Whistler, British Columbia. Indulge in complete relaxation poolside or fulfill your need for adventure at any of these pet-friendly resorts with hiking, biking, world-class golf, and even skiing. Whether you prefer the beach, the mountains, or the desert, there's a great resort out there that awaits Fido's arrival! Make your next summer family vacation complete! How many resorts in the US allow you to stay literally INSIDE a wildlife preserve? The Exotic Resort Zoo does just that, combining cozy cabins with fascinating, beautiful creatures from around the globe. This independently-owned and operated zoo safari resort and preserve is just as committed to its guests as it is to its over 700 animals (from 80 different species). Cabins are spacious and full of the modern charms you'd expect from a luxury resort, but lets be honest- you've come for the animals! The Exotic Resort Zoo features several endangered species of animals, giving them a chance to increase their numbers, while also allowing visitors to safely enjoy their company and natural beauty. Tours are led daily, some from car and others up close and personal. One thing's for certain: you're going to see a lot of animals throughout the resort's 137 sprawling wooded acres! A free zoo tour with animal feeding and petting is included. Amenities include an outdoor pool with a waterfall, a shallow pool for kids and a hot tub. Standing at the foot of the Blackcomb side of Whistler’s twin giants, the Four Seasons Resort luxury hotel pairs rustic mountain charm with modern European elegance. Under peaked roofs, find impeccable Four Seasons comfort with a wide variety of spacious (and pet-friendly) accommodations boasting amazing mountain views! The hotel is the perfect destination for business and leisure travelers alike, and with over 15,000 square feet of flexible function space, you can easily plan your next group event surrounded by luxury and the natural beauty of the area. And, you won't have to wait until the snow falls to plan your trip. Two championship golf courses, designed by legends of the game Arnold Palmer and Jack Nicklaus, sit within five minutes of the resort. Or, enjoy a horseback riding, zip lining, kayaking and much more! Start planning an unforgettable getaway at Four Seasons Resort Whistler now! Home to what is by far the largest ski resort in all of North America, the pedestrian village of Whistler itself has won numerous design awards. Beyond its famed slopes are championship golf courses, hundreds of boutiques, museums and galleries and endless year-round events and activities. Make your family vacation to Whistler a complete one by bringing along Fido, as Four Seasons Resort Whistler does have pet-friendly accommodations. Included pet amenities include a bed, bottled water, food, and a water bowl. At the gateway to the Olympic Peninsula, discover the beauty and luxury of The Resort At Port Ludlow. Just a ferry ride and scenic drive from Seattle and minutes from historic Port Townsend, recharge at this lovely 37-room waterside resort. With breathtaking views of Ludlow Bay and the lush tree-lined coast, Port Ludlow offers a quiet retreat for families and couples. Onsite you can indulge in a round of golf at their 18-hole top-rated golf course, kayak and fish at the bay, and enjoy beautiful nature hikes nearby. Or simply sit back and just relax with an in-room spa treatment! And remember to bring Fido along; pet-friendly accommodations are available! 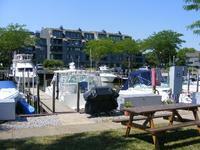 At this boutique, waterfront inn all types of pets without size or weight restrictions are allowed. In fact, one third of all accommodation options are available for pets! The Resort at Port Ludlow is pleased to provide fresh bowls of water located at the entrance to the Inn, complimentary dog treats that are made locally, ability to dine on the veranda while your pet relaxes in the grass adjacent to the restaurant. A variety of pet supplies are also available (just in case the leash or food bowl gets left at home), as well as a map with indicated pet-friendly hiking trails, and designated clean-up sites with baggies. The Resort at Port Ludlow is just a half-hour ferry ride from downtown Seattle or Edmonds and a scenic drive from Bainbridge Island or Kingston to Port Ludlow, 90 minutes from Sea-Tac International Airport, or arrive by float plane from Seattle’s Lake Union. From Highway 3 North or Highway 104, go west across the Hood Canal Bridge, travel 1/8 of a mile and turn right onto Paradise Bay Road. Travel approximately 5 miles to Port Ludlow. At White Wing Resort, among the hardwoods of the Ozarks, you are remote enough to hear the whippoorwills at night, yet only minutes from all the fun and excitement that the Branson area has to offer. White Wing Resort on Table Rock Lake is proud to offer pet-friendly accommodations for those who cannot bear the idea of leaving their beloved four-legged friends behind. Just make sure they are kept on their best behavior. Also, feel free to take advantage of the resort's dog walking service. Book today! Enjoy a boat ride together, or any number of water sports! If getting wet doesn't interest you, kick back with a good book on the shores. Comfort comes naturally to Southern Oaks Inn, an intimate St. Augustine, Florida hotel nestled on six wooded acres amid the oldest city in the United States. Southern Oaks Inn is located just a mile-and-a-half from historic downtown St. Augustine, keeping you close to all the exciting attractions. The historic beaches of St. Augustine are only a few short steps from your hotel. St. Augustine Beach covers a vast coastline with miles of beaches from resort-style to unspoiled coves. The majority of beaches in St. Augustine are pet-friendly, so you and your pet are free to enjoy some fun in the sand together. Southern Oaks Inn offers dog-friendly accommodations, so there’s no need to worry about leaving your four-legged friend behind. They even offer access to a private dog run, so your furry companion can play freely while you kick back and relax on the inn’s scenic grounds. At Southern Oaks Inn, enjoy a free hot country breakfast each morning, free wireless internet, and free parking. Escape to a place where you can let your worries and stress fade away, where the quiet luxury and beauty of Palm Springs will rejuvenate you. The Westin Mission Hills Resort & Spa is your idyllic Palm Springs destination. Its secluded location with stunning mountain views takes you away from ordinary life and presents a soothing utopia for your private vacation. Choose from a variety of spectacular guest rooms, make a splash at one of three onsite pools and 60-foot waterslide, or indulge in a revitalizing treatment at the spa. The Westin Mission Hills is also home to two championship golf courses: the Pete Dye course and the Gary Player Signature Course. Plus, you can enjoy a luxurious dining experience at Bella Vista, or grab a quick meal at the poolside grills! The ultimate pet-friendly California getaway awaits in Palm Springs! At The Westin Mission Hills Golf Resort & Spa, we LOVE our pets. Dogs up to 40 pounds are welcome to stay with guests and will enjoy the signature Westin Heavenly® Dog Bed. Dogs are not allowed in some outlets or on pool deck. Guests are responsible for clean-up and any extra cost associated with clean-up. Dogs are welcome to dine with our guests at Pinzimini and Fireside. Grab Fido, Rover, and Spot and get over to Sawmill Creek right now! ​Sawmill Creek Resort allows dogs under 35 lbs to stay in your room with you! In fact, this is so common that special arrangements are made for guests staying at the lodge whilst they compete in a breed show- so you know it's gotta be good! Once you're settled in, get over to the adjacent Sheldon Marsh Nature Preserve for an extended hike! Home to the last remaining Ohio example of a Great Lakes coastal wetland, the preserve stretches from the forested canopy of its entrance to the sandy beach at its conclusion. Your pup will absolutely love it! The resort is adjacent to Sheldon Marsh Nature Preserve and 7.2 miles from the amusement parks at Cedar Point. The property features an 18-hole golf course, a marina and shops set in an 1887 barn. Located off the Gulf of Mexico, TradeWinds Island Grand directly on the white sand beaches of St. Pete Beach -- voted the No. 1 beach destination in the U.S. by TripAdvisor's 2012 Travelers' Choice Award. Having just completed a $20 million renovation -- Island Grand boasts 585 newly-renovated guestrooms and suites. Located just 30 minutes from Tampa International Airport, Island Grand offers a variety of recreation activities including JetLev flight center, motorized surfboards, Splash Island Waterpark, Kid’s programs, paddleboats, tennis, a three story tall inflatable water slide, and more. Lounge next to one of five onsite heated pools or sip on your favorite cocktail at Salty's Poolside Beach Bar. This beachfront setting has a hint of the Island tropics and offers a beach vacation where you run out of vacation before you run out of things to do. All you have to do is pack your things (and don't forget about your pet) -- we’ll pack your stay. Your four-legged friend is always welcome at Island Grand! Standard views and Gulf Front views are available in 48 Pet-Friendly Suites. Complete with two double beds and a double-size sofa bed, you and your beloved furry friend can enjoy a weekend away in St. Pete Beach! From St. Petersburg/Clearwater Airport: Turn left out of airport onto Roosevelt and follow signs to I-275 South through St. Petersburg, approximately 13 miles. Exit I-275 at the St. Pete Beach/Pinellas Bayway Exit (exit 17). Proceed West across Pinellas Bayway (toll) which takes you directly to St. Pete Beach and ends at Gulf Blvd. Turn right, and the TradeWinds Resorts are on the left hand side of the street, about 1.5 miles north.